This article investigates the social media content of women who are affiliated with the Islamic State. Throughout one year, ninety-three Twitter accounts were tracked to explore the patterns of engagement by pro–Islamic State women online and examine how these patterns illuminate the roles that pro–Islamic State women occupy on social media networks. The study reveals that women who associate with the Islamic State mostly preserve the traditional gendered role of support in the online realm. However, support is not their exclusive role and some women are active in the organization, using Twitter to recruit, promote, and even commit terrorist violence. The only regret I have is not making Hijrah to the Islamic State earlier.11. Tweeted by a IS-associated woman within the sample. Tweets that refer to hijrah, such as the one above, are common among Twitter users who support the Islamic State (IS). Many IS supporters use the social media networking site as a platform to spread propaganda and encourage followers to make hijrah to the IS. One such example is an American woman who was given the moniker “ISIS Superstar” after flooding Twitter with pro-IS propaganda. Her comments frequently violated Twitter’s terms and conditions for use, and prior to her arrest in February 2016 for threatening two Federal Bureau of Investigation (FBI) agents, she had created nearly one hundred different Twitter accounts. Although the “ISIS Superstar” never migrated to Iraq or Syria to join the IS, various other individuals have and were encouraged by these types of propagandist messages via Twitter. Whereas numerous Western men have made passage to Syria and Iraq to become foreign fighters, less is known about the reasons why women choose to migrate and the roles they play once in IS-held territory. This research uncovers the roles that women play in online social networks associated with the IS. It challenges the gendered assumption that women play strictly supportive roles within the IS, and demonstrates that women who are associated with the IS hold multiple roles in online and real-time social networks. The researchers of this study completed an in-depth analysis of women’s pro-IS Twitter accounts over a one-year period and discovered that IS women do not exclusively hold supportive roles, but a variety of nontraditional roles as well. This article is divided into the following sections. The first section investigates the relevant literature on the traditional roles of women within pro-jihadist organizations in order to compare similarities and differences in the roles they adopt in their online and offline worlds. IS’s social media strategies are also examined to determine how women use the sites and how their actions impact the organization’s goals. The second section outlines the specific procedures used to investigate the research questions and the ways in which the data were qualitatively collected and analyzed. The third section summarizes the results with an explanation of eight different types (or roles) of pro-IS women, as well as examples of tweets. 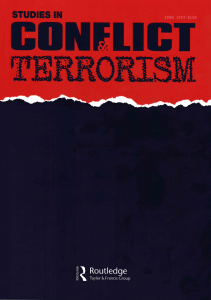 Finally, the fourth section discusses the main research findings of this exploratory study and how these findings can be used to develop more effective counterterrorism and anti-radicalization strategies.